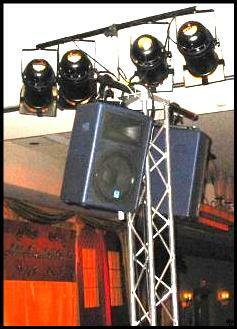 Along with our professional services, we carry a complete line of audio visual rental equipment. Everything from a Screen rental...video projector rental…wireless microphone rental... to stage lighting equipment rentals. All equipment is strictly professional grade. All our services include delivery, set up, and pick up—we do not offer counter services. If we don’t have it we will recommend someone that probably does ! · We do not have the ability to service pickup and returns at our location, all equipment is delivered and picked up by our personnel. A Security deposit is required. · All rentals shall be paid for at or before delivery unless the complete documentation set (including Tax exemption certificates) is filled out and approved and/or a purchase order is received. · In addition to the rental charges, rentals shall have a cash or check security deposit of approximately 40% of the new equipment value (unless purchase order is received). · We are registered with the state of Connecticut and charge Ct. State sales tax unless proper tax exempt paperwork is supplied at the time of pick up. · Organizations renting equipment shall be responsible for the return of all the equipment in good working order and no visible degradation in the functionality or appearance. · We carry full liability insurance. · We accept cash, checks and major credit cards. . .
We will deliver to most locations in Connecticut, the price of delivery is based upon distance from Monroe. Delivery does not include setup or training or tuning of the equipment these are extra and based upon the time involved. 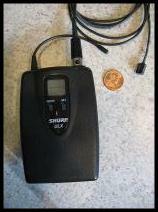 Wireless Microphones— What you Get…. When ordering more than one wireless mic the receivers will come in a rack case for transport. The case will have a single AC power cord and several mic cables arranged together to neat connection to the mixing console. All antennas are internal to the plastic rack case, we have never had a problem with reception with this method. External Yagi style paddle antennas are available as an option. The beltpack transmitters are self contained and use one 9 Volt Alkaline battery each. Each Transmitter comes with one mic element that can be lavaliere (tie clip) or head mounted. Tape and bobby pins are recommended but not supplied. We recommend that several bobby pins be used for attachment of the mic element to clothing. Tie clips are optional (as they are frequently not returned). Batteries can be ordered for pickup at the same time as the equipment. Battery life should be figured as 7 hours. This usually works out to one battery for two rehearsals. We recommend that the batteries be changed before every performance. This plan has worked well for our customers for the last 10 years. Unless you are familiar with the use and setup of wireless mics, you may have some challenges ahead of you. Physics tells us that the more microphones you turn on, the greater the chance of feedback (howling) in an audio system. The operator of the sound board must be trained in the use of this equipment. The Radio Frequency (RF) environment is constantly changing. The recent re-allocation of the TV spectrum to handle solely the Digital broadcast system and the resultant sell -off of some frequency bands is going to effect the way we can use wireless mics in the near future. It is recommended that if you are not familiar with these products, that you consider having us come in to train your people, evaluate the RF environment and tune the system for maximum volume before feedback. Ask about our Wireless mic setup and tuning package. Note: Wireless mic transmitters and mic elements are fragile, the customer is expected to instruct the users of the equipment on the correct care and operation of these devices. (information supplied at pickup time) Equipment not returned fully functional will have a portion of the security deposit withheld for repair of the equipment. The mini boom mics are great for the longer haired individuals as the behind -the -head strap shows up if not buried under a wig, hat or hair. these WBH53 booms are $25 extra each. there are only 8 of them available some tan, some black. We will deliver and setup the equipment for you, this is included in the rental price. We do not have a pickup/return counter, and can not accept requests from individuals desiring this service.